The interactive La Ruta dramatizes an experience that many immigrants know too well—and senators could learn from. I got lost outside of New York’s Cathedral of St. John the Divine this past weekend, eager to attend The Working Theater’s La Ruta—a play created in collaboration with the Magnum Foundation that dramatizes the plight of border crossers and their smugglers on a cargo truck headed from Mexico to the United States. Laminated signs outside the church pointed to a dimly lit driveway, where a woman pointed a flashlight on me, making it impossible for me to see ahead. Audience members were crammed into a tent where Raula, a smuggler played by Sheila Tapia, quickly unsettles whatever comfort you might find. Raula previews some of the potential dangers as the audience learns that we, too, are migrants on this road—but reminds us that everything on this trip happens on a need to know basis. The audience is then rushed over to a large white truck, boarding through a side door while Raula barks orders. Any hesitation is corrected—while taking seats on cardboard boxes, I switched with someone while Raula immediately shouted, “What is this? Musical chairs? Figure it out already!” If it wasn’t already clear a few minutes into the performance, feeling disoriented and ill-at-ease about what’s happening is exactly the point. As lawmakers prepare to mark up the massive comprehensive immigration bill in a little less than two weeks, everyone seems to be talking about immigration, or at least have an opinion about it. While some have been thoughtful in their approach, others have indicated how little they know about what it might mean to cross the border. At last week’s Senate Judiciary Committee hearing, Arizona’s Jeff Flake joked about a woman he saw being apprehended as she attempted to cross the southern border during a recent trip with some of the Gang of Eight lawmakers authoring the comprehensive immigration bill. Department of Homeland Security Secretary Janet Napolitano laughed—but the bad joke didn’t end there. New York’s Chuck Schumer revived it during a breakfast conference about the bill, recalling that “The lady that we saw at the border heard my New York accent, thought she was already in New York.” If the bill’s leading Democrat can trivialize something as harrowing as crossing the border, and demean a migrant’s ability to distinguish a place like the desert from a skyscraper city into a crude joke, it might mean that the public has a long way to go in understanding how and why people cross. La Ruta has created a space in which to do that. 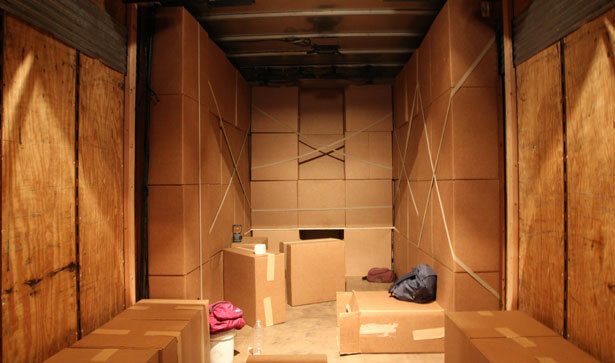 Thirty audience members pack into the truck, while three more—who we soon learn are actors—enter through the back, to find another migrant who’s already asleep on board. For the next hour or so, we learn a little about them and their motivations. They’re not all immediately the most sympathetic characters. We find out, for instance, that Francisco, played by Gerardo Rodriguez, is technically a gang member from El Salvador—the kind of person that the current immigration bill would make immediately deportable. But La Ruta illustrates that Francisco has a story that also needs to be heard. Like everyone else on board, he’s a human being first and foremost. And this is the story about everyone on a truck trying to get to the United States by the Fourth of July. As time progresses, so does the audience’s sense of anxiety. Some try to prop themselves up and stretch their arms and legs. Others remove scarves and jackets as the temperature heats up in the back of the truck. Others still stand up at some points, trying to relieve a sense of desperation, coupled with claustrophobia. La Ruta works because of its creative staging and superb acting—and it succeeds because it makes the audience physically uncomfortable and mentally estranged from a topic we all think we know something about. It reminds the audience that their silence around immigration might make them complicit in an unjust system. Even as we quickly learn to despise the smugglers and their co-conspirators, we remember that there are policies behind these stories that often mark the difference between life and death. Those of us who are lucky enough to make it out of the cargo truck alive are somberly given blue passports that explain the ins and outs of the immigration debate, which include campaigns and resources to plug into. Audience members, many visibly shaken from the play, wander out to an interactive exhibit. Schumer’s disposable “lady at the border” becomes a person with a story on La Ruta—and the audience might walk away knowing a little more about the basic humanity of migrants than the senators who sometimes make a living belittling them. La Ruta is showing in two more New York boroughs through May 12. Tickets are $23, $25. Immigrant rights advocates are leading this year’s May Day charge—under the FBI’s watch. Read Allison Kilkenny’s analysis.